“Funeral at Sylvan Theater,” Histories of the National Mall, accessed April 23, 2019, http://mallhistory.org/items/show/536. In May 1921, two local American Legion posts held a funeral at the Sylvan Theater to honor men from the District of Columbia who died overseas during World War I. 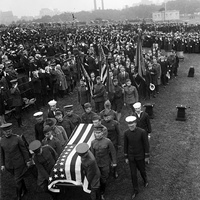 The remains of Hiram F. Cash and Vincent B. Costello were present at the funeral. 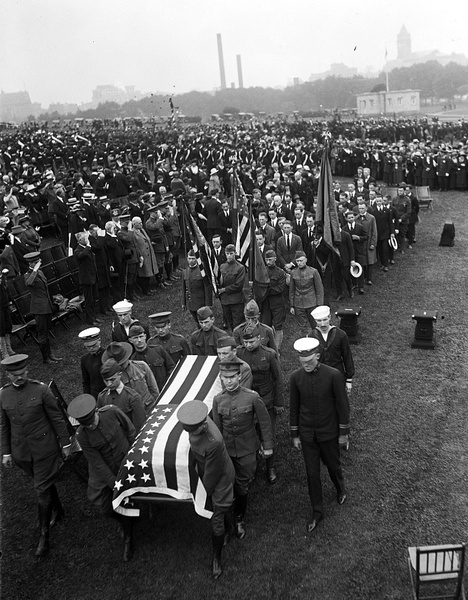 Although World War I ended in 1918, the remains of soldiers killed in Europe were not returned to the US for another 3 years. 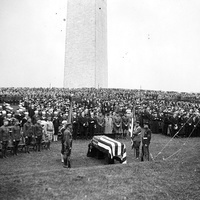 Private Costello was one of the first men from the District to die in the war, and Lieutenant Cash was a Washington native who died on the Western European front. The American Legion posts in Washington, DC were named in their honor.